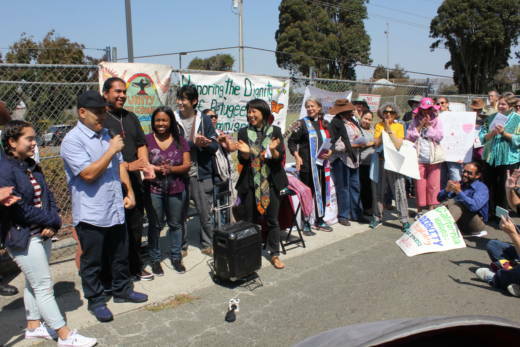 Immigrants rights advocates who helped raise tens of thousands of dollars to bail out an undocumented immigrant celebrated his homecoming Saturday outside the Richmond jail where he's been detained since last March. Hugo Aguilar was one of the last eight immigrants being held at the West County Detention Facility before it closed its immigration wing last week under public pressure to sever ties with Immigration and Customs Enforcement. With his family at his side, a relieved-looking Aguilar stood outside the jail's guarded gate and told a group of immigration advocates and volunteers that for the year and a half he was held inside the building for entering the country illegally, he could hear their protests, and they gave him hope. "I wish that no one would have to go through what I went through," Aguilar said. "I think for freedom there is no price." But in Aguilar's case, there was: $80,000. That's the amount that a judge set at a hearing on Aug. 22 to determine what should happen to Aguilar once the West County Detention Facility stopped housing federal immigration detainees. It was bittersweet news for the carpenter — who's been in the United States for more than 20 years — and his family, including his three kids. "The immigration judge that presided over Hugo's bond hearing retaliated against the immense display of community support by setting an exorbitantly high bond," said Rebecca Merton, the national visitation coordinator and an independent monitor for Freedom for Immigrants, an organization working to abolish ICE detention. "The highest I've ever seen." Merton said the average bail in an immigration case like Aguilar's is $10,000. Aguilar was released on Thursday after managing to post bail through a combination of family loans and donations from national and local groups including Freedom for Immigrants, the Immigrant Family Defense Fund, RAICES and the Interfaith Movement for Human Integrity. According to the Interfaith Movement for Human Integrity, Aguilar first came to the United States in 1994 with his parents. In 2005, he was convicted of a drug offense that led to his deportation two years later. He returned to the country without documentation in 2008, and in 2017, he was arrested for domestic violence. No charges were filed, and he was released from Santa Rita Jail the same day. That's when he was picked up by ICE and sent to the West County Detention Facility, where he was held until his release this week. Aguilar's asylum appeal was denied in February, and he is currently appealing the decision to the 9th U.S. Circuit Court of Appeals. 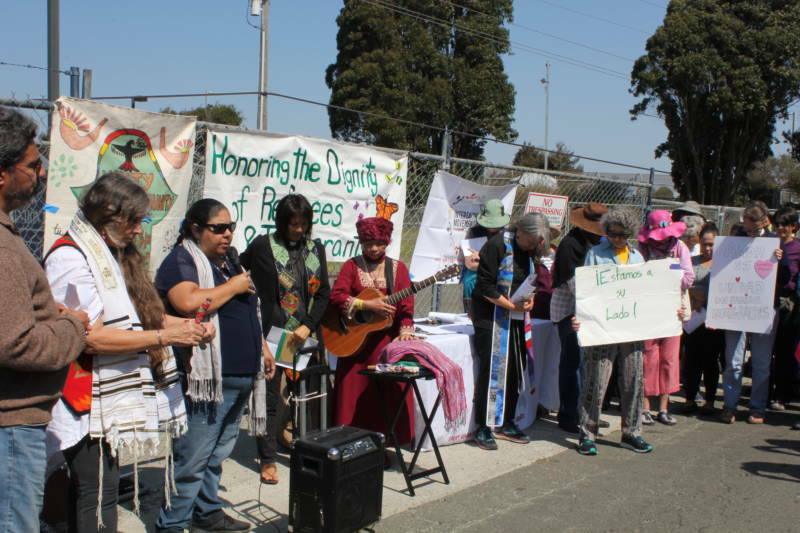 Since July, Merton says Freedom for Immigrants has raised at least $120,000 to help more than 100 immigrants who have been transferred from the Richmond facility, sometimes to far-flung locations. But Merton says more is needed. "Even though people are no longer in this particular facility, they are in other facilities," she said. "And it's up to our community to show our solidarity so they can get bonded out." San Francisco Immigration Court officials, including the judge who oversaw Aguilar's case, could not be reached for comment.